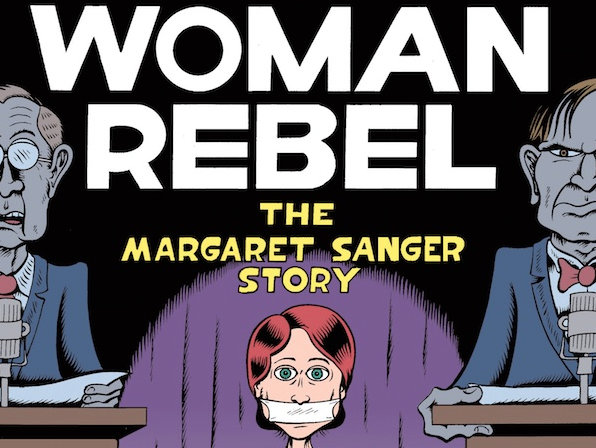 We continue our talk with underground comics legend Peter Bagge (Hate) at Earth Prime Time to talk about his latest: Woman Rebel: The Margaret Sanger Story fromDrawn and Quarterly. Peter’s biographical hardcover graphic novel takes a look at one of feminism’s most controversial and important icons. Sanger’s (September 14, 1879 – September 6, 1966) life’s work was devoted to legalizing birth control and played a part in forming what is known today as the Planned Parenthood Federation of America. Peter’s book tour stops at Brookline Booksmith on Monday, October 21. DIGBOSTON: You could say she was a loudmouth. She wrote columns in newspapers, she was a socialist. There’s so much to her. Peter Bagge: She lived a long life, she was in her 30′s when she became very active in politics in general and more specifically in birth control. Her politics, as is the case with most people, evolved over time. You know that adage, if you are young and not a liberal, you don’t have a heart, if you are old and you aren’t conservative, you don’t have a brain. That would describe her. It’s not like she did some 180. Some people would say to me, did you know she voted Republican? Technically yes, that was true, she was more supportive by the 1950s of Republicans, but that was only because the only people that would support birth control were the Republicans. By then, the Democrats, a huge part of their constituency were blue-collar Catholics. Yet one more irony, the one person in Washington who was the most upfront about legal access to birth control was a senator from Connecticut, Prescott Bush, George W. Bush’s grandfather—who lost re-election for sticking his neck out for birth control.